Imagine being able to practice for hours and hours, indoors or outdoors, day or night, without worrying the pain of wrist exhaustion! Now you can: Our ETCBUYS table tennis paddles have an ergonomic flared handle, you'll be able to perform better and longer without having to fear wrist fatigue. This is great for you because you'll be able to out train the competition! The problem with other ping pong paddle sets is poor workmanship that causes the pads to fall off. Our professional ping pong paddles solve that problem! Why? Our 4 pack pro ping pong paddle set has high-performance pads with extra strong glue and an eco-friendly, natural rubber. Which means you'll be able to use these paddles for a long time without worrying that they'll suffer the usual wear and tear. Never suffer worrying about glueing paddles back together again! Our table tennis paddle set comes complete with eight tournament 40 mm white balls meet ITTF equipment regulation (size and weight) for official table tennis competition and a blue color zipped cover case, designed for compact storage, protection and a travel convenience! What that REALLY means to you is you'll be able to take this set with you anywhere, AND that ultimately means you'll be able to take your game anywhere! 100% SATISFACTION GUARANTEED With THOUSANDS of Perfect Orders, you can be confident that your satisfaction is always our #1 priority and that we'll do everything in our power to make sure you have an excellent customer experience. It's that simple. "Why Wait!? 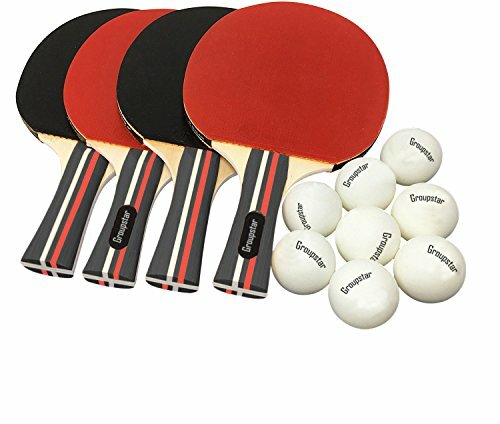 Click "Add to Cart" to order your Four Blades with Eight Ping Pong Balls and other outdoor & indoor recreational games today! BE READY TO OUT TRAIN THE COMPETITION: Imagine being able to practice for hours and hours, indoors or outdoors, day or night, without worrying the pain of wrist exhaustion! Now you can because these table tennis paddles have an ergonomic flared handle, you'll be able to perform better and longer without having to fear wrist fatigue. This is great for you because you'll be able to out train the competition! UPGRADE YOUR PLAYING STYLE: Because you don't have to worry about wrist fatigue and pain, now you can focus on perfecting the finesse of your playing style. Our ping pong paddle set is perfect for that! Our 4-pack pro ping pong paddle set has the perfect build to create the best balanced spin, control, speed and power. That means that you'll be able to perfect all areas of game play and speed ahead of the competition and become a more versatile player. PLAY LIKE THE PROS! ITTF EQUIPMENT REGULATION: Our table tennis equipment comes complete with eight tournament 40 mm white balls meet ITTF equipment regulation (size and weight) for official table tennis competition and a blue color zipped cover case, designed for compact storage, protection and a travel convenience! What that REALLY means to you is you'll be able to take this set with you anywhere, AND that ultimately means you'll be able to take your game anywhere! EVERYTHING YOU LOVE ABOUT TABLE TENNIS ACCESSORIES Plus LOVE IT OR LEAVE IT SATISFACTION GUARANTEE! There's no question, this 4 pack pro ping pong paddle set has everything you're looking for! Check the Reviews and see what other customers have to say! With ETCBUYS you can always be confident that your satisfaction is always our #1 priority and that we'll do everything in our power to make sure you have an excellent customer experience. No questions asked. It's that simple!